Why Are There Not Taco Trucks on Every Corner? Because government has waged war on tacos for 100 years. When Marco Gutierrez, a founder and spokesman for the little-known and sparsely populated advocacy group “Latinos for Trump” recently tried to warn America of the grave dangers of open borders and free migration with the image of “taco trucks on every corner,” most viewers, Latino and Anglo alike, seem to have experienced a vision of a possible new utopia. The tag immediately trended on Twitter, not in panic but in near-universal celebration of the possibility. What people do not know is how hard government has worked for years to prevent this from happening. The War on Street Food has been going on for more than 100 years. And it’s not just tacos. There are also illegal tamales. Look at this headline from a story last year in the Los Angeles Times: "450 illegal tamales from Mexico seized at LAX and ‘incinerated’". The passenger arrived from Mexico on Nov. 2 and was stopped by U.S. Customs and Border Protection agriculture specialists, who found 450 pork tamales wrapped in plastic bags in the passenger’s luggage. The passenger apparently denied that the tamales were made with pork, which is on the list of products that travelers may not bring into the country under customs regulations. For many families, tamales are a quintessential holiday tradition. Making a batch takes days of planning and exhaustive preparation — all for a tasty bite of corn masa, red chile mole and pork, beef or chicken.
. . . The passenger, who was not identified, was fined $1,000 because authorities believed the tamales were going to be sold and distributed. All 450 of them were destroyed. The tamales were literally “incinerated,” a Customs and Border Protection spokesman said. Los Angeles Times, 18 November 2015. Now of course Customs is being ludicrous, mean-spirited, invasive and petty. This is a heavy fine, and a pointless assault on the freedom of a peaceful traveler who did nothing to violate the rights of even a single living soul. By 1901, more than a hundred tamale wagons roamed Los Angeles, each paying a dollar a month for a city business license. Their popularity spurred others in outlying cities to follow their example. In 1906, Sonoran immigrant Alejandro Morales began selling his wife’s tamales from a wagon he commandeered through Anaheim. Morales, a ditch digger by trade, grew the concept into a restaurant, then a tamale factory, then Alex Foods, a multimillion-dollar empire now known as Don Miguel Mexican Foods. . . . It wasn’t just Latinos who operated tamale wagons — African Americans, European immigrants and whites also partook in the industry. 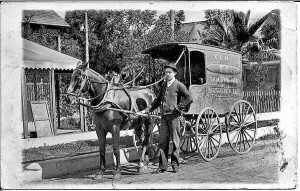 In 1905, even the YMCA opened a temporary tamale wagon to raise funds so it could send a boy’s track and field team to compete in Portland, Ore.
Los Angeles Times, 8 September 2011. 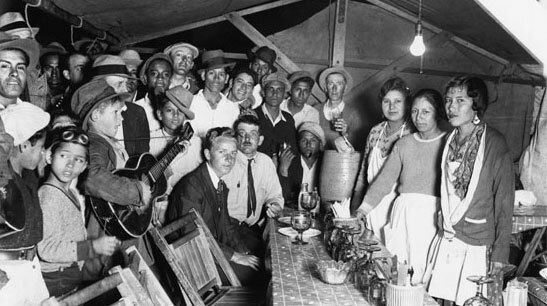 Mexican food was also seen as a threat to white workers, both through unfair competition and labor radicalism. Nativist opponents of immigrant workers claimed that the Mexican diet of tortillas and chili, like the Chinese staple rice, undermined the nation's standard of living. "No white man can work for Mexican wages," reported one journalist from an El Paso chili stand in 1884. "A bowl of this stuff costs 10 cents," he quoted a down-and-out worker.... Mexican food was also associated with anarchism and union organizing. Tamale vendors were blamed for the Christmas Day Riot of 1913, when police raided a labor rally in Los Angeles Plaza. Milam Plaza in San Antonio, where the chili queens worked in the 1920s, was a prominent recruiting ground for migrant workers. Customers could eat their chili while listening to impassioned speeches by anarcho-syndicalists of the [Industrial] Workers of the World and the Partido Liberal Mexicano. —Jeffrey Pilcher, Planet Taco: A Global History of Mexican Food (2012), p. 113. Strangers coming to Los Angeles, reported The Times, remark at the presence of so many outdoor restaurants, and marvel at the system which permits men … to set up places of business in the public streets … competing with businessmen who pay high rents for rooms in which to serve the public with food. Not everyone appreciated those first loncheras. L.A.’s press sensationalized any fight, quarrel or theft committed around the eateries, leading to a perception in polite circles that they weren’t safe (typical headline: “Says the Tamale Wagon is a Nursery of Crime”). Los Angeles school trustees constructed kitchens at the city’s high schools (including the first prep cafeteria in the country at Los Angeles High) in 1905 to offer healthier lunches after having “long waged a crusade against the tamale wagons,” according to the Herald. And in 1910, 100 downtown businessmen signed a letter asking the council that tamale wagons be prohibited because they didn’t reflect well on the district. In both Texas and California, street vendors found themselves increasingly popular with the city, but struggling to fend off concerted attacks from the city government. The San Antonio city fathers restricted hours of sale and then finally ejected chili stands from Alamo Plaza near the turn of the century, but met resistance when chili queens continued to set up stands in defiance of the law. The plaza, of course, transformed into Olvera Street, as a new generation of Angelenos wanted a more refined Mexican culinary experience than that offered by the chaos of Tamale Row. As the automobile grew in popularity, Latino families loaded up their trucks and drove through East Los Angeles selling food before settling in downtown, the precursor to today’s loncheras. By 1929, when Samuel C. Wilhite received a patent for a “Tamale Inn” — a tamale wagon shaped like its eponymous snack complete with awning, rows of windows, and even steps — there was no need for it. He parked it on Whittier Boulevard and named it the Tamale, where the structure still stands, although it’s currently a beauty salon. The last tamale wagon on Southern California’s roads belonged to the Morales family: their Tamale Wagon, a legendary sprint car that captured the minds of race fans for decades. The truth is that we could — and should — have had taco trucks on every corner, tamale wagons on every major thoroughfare, chili queens ruling every public plaza, decades ago if not for the suspicious gaze of city regulators, the protectionist interests of brick-and-mortar restauranteurs, the itchy hyperregulation of urban improvers, and the cosntant effect of border-control hysteria, nationalist culture policing and anti-immigrant moral panics. Here's to a day when American street food is free of such burdens. Free the taco trucks and all political prisoners.